18 holes, par 72, 7,210 yards. Links. 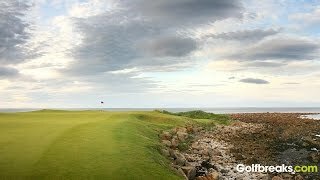 Like many courses in the area Kingsbarns Golf Links has an extensive golfing history and heritage, with golf having been played on the site since 1793. The course however was redeveloped in 2000 by Kyle Phillips and is now considered one of the best links courses in world golf. Consistently ranked as one of the top courses in the area and in the world Kingsbarns is a true links golf course, perfect for a traditional golf vacation to Scotland. Kyle Phillips has used the landscape here to great effect and panoramic views of the superb surroundings are available on most tees. As you would expect from a golf course of this prestige it is immaculate and allows visitors to recognise the undulating fairways and fast greens. Just a short distance from the ‘home of golf’ at St Andrews, the revered Kingsbarns Golf Links course is steeped in heritage and visitors will definitely get the sense of something special when arriving at the golf course. No doubt many of the holes at Kingsbarns will provide unforgettable experiences but none more so than the signature 15th hole or ‘Rocky Ness’ which is a lengthy par 3 that is adjacent to the seafront and as such offers great views but a tough tee shot. When customizing a perfect golf vacation to Scotland, Kingsbarns Golf Links should certainly feature on the itinerary. Kingsbarns operates a strict dress code for visitors and golfing attire is mandatory at all times during your visit to the prestigious Kingsbarns. Kingsbarns are famous for their professional and courteous caddies and forecaddies, it is imperative that these caddies are booked in advance of your visit to Kingsbarns golf course. In addition to the above guests can also hire clubs, electric trolleys and shoes but no golf carts as it is a walking course. There is an impressive practice range at which is only a short walk from the first tee and offers golfers complimentary balls to aid their warm up before taking to the truly impressive course.